AMMAN — The Mujib Biosphere Reserve has reopened for another adventure season with additional safety measures in place to protect its visitors, according to its director, Hisham Dheisat. 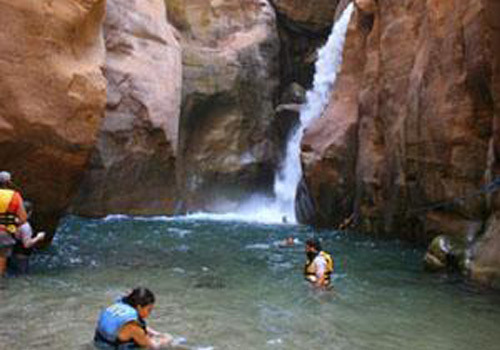 “The new safety measures and regulations were introduced after the formation of the water valleys changed during winter,” Dheisat told The Jordan Times on Tuesday. Although the wet season was generally dry, the Kingdom’s southern and eastern regions received abundant rain, he said. “Heavy rain caused flash floods that brought along so much soil. This has caused the formation of three to four new pools with depths ranging between five and seven metres and a length of 100 metres,” Dheisat added. A growing eco-tourist destination for hiking and camping, the Mujib reserve is home to high-altitude summits and waterfalls. It closes every winter due to flash floods and rising water levels in its valleys and trails, reopening in spring. Ropes that assist visitors hiking along the water valleys and up the waterfalls, as well as warning signs at dangerous locations, and the deployment of lifeguards and Civil Defence Department (CDD) personnel on weekends are standard safety measures at the reserve. The team usually recommends adding more ropes and closing certain areas to avoid accidents, especially since the water levels of hiking trails — which involve both climbing and swimming — differ every year depending on the amount of rainfall during winter. “This year, we have added three to four lifeguards to be stationed at every pool. They are available at all times. In addition, another four lifeguards from the CDD are deployed on weekends to ensure the safety of our visitors,” Dheisat said. Wearing a life jacket has always been obligatory while hiking in the water valleys; however, some tourists take them off, he noted, adding that starting this year, those who do not keep their life jackets on at all times will get a refund and be escorted out of the reserve. The reserve’s administration briefs visitors on the difficulties along the trails, according to the Royal Society for the Conservation of Nature (RSCN), which obliges tourists to wear life vests and sign waivers indicating they are aware of potential hazards on the trails and absolve the reserve of any liability.